Abstract. Characterization of permafrost, particularly warm and near-surface permafrost which can contain significant liquid water, is critical to understanding complex interrelationships with climate change, ecosystems, and disturbances such as wildfires. Understanding the vulnerability and resilience of permafrost requires an interdisciplinary approach, relying on (for example) geophysical investigations, ecological characterization, direct observations, remote sensing, and more. 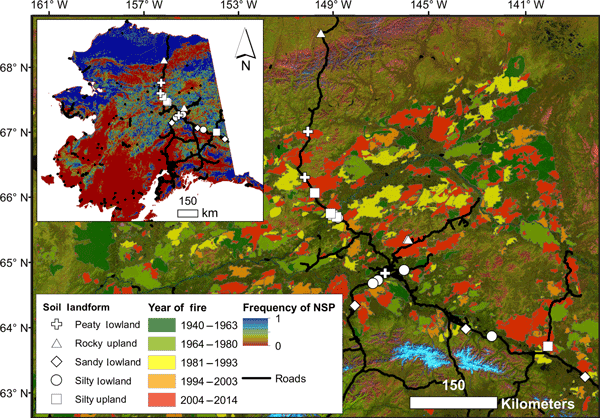 As part of a multiyear investigation into the impacts of wildfires on permafrost, we have collected in situ measurements of the nuclear magnetic resonance (NMR) response of the active layer and permafrost in a variety of soil conditions, types, and saturations. In this paper, we summarize the NMR data and present quantitative relationships between active layer and permafrost liquid water content and pore sizes and show the efficacy of borehole NMR (bNMR) to permafrost studies. Through statistical analyses and synthetic freezing simulations, we also demonstrate that borehole NMR is sensitive to the nucleation of ice within soil pore spaces. How to cite: Kass, M. A., Irons, T. P., Minsley, B. J., Pastick, N. J., Brown, D. R. N., and Wylie, B. K.: In situ nuclear magnetic resonance response of permafrost and active layer soil in boreal and tundra ecosystems, The Cryosphere, 11, 2943-2955, https://doi.org/10.5194/tc-11-2943-2017, 2017. 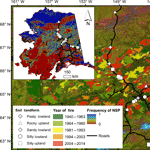 Geophysical methods have wide applications to permafrost studies. We show that borehole nuclear magnetic resonance is a valuable geophysical tool to rapidly characterize the liquid water content and unfrozen pore space in warm permafrost through simulation and field study. This technique is also sensitive to the ice nucleation process in situ. This method, which is applicable in a variety of soil types, can be used for single observations or for time-lapse monitoring of permafrost changes.